The women’s NCAA swimming talent pool is without at least one big-time competitor this year because of the loss of five-time Olympic gold medalist Katie Ledecky. She turned pro after leading Stanford to its second consecutive team title. Though the Cardinal still boasts plenty of talent, last year's runner up team California and third-place Texas A&M will fight for their chance to dethrone the defending champs. Eastin enters the 2018-2019 season as a three-time defending national champion after she won the 200 IM, the 400 IM and the 200 butterfly at last year’s NCAA meet in March. She also beat Ledecky in the women’s 400 IM by 3.69 seconds and will now be looking for her fourth consecutive title in the event. Eastin additionally made the Pan Pacific team in the 200 IM after an emotional third-place finish at U.S. Nationals which gave her the opportunity to race some of the best in the world right before the start of the college season. Drabot returns this year after being a part of two national championship relays at last year’s NCAAs and also earning silvers in the 500 freestyle and the 200 fly. In both races, she finished just behind her teammates, Ledecky in the 500 and Eastin in the 200 fly. Stanford’s depth in both events is evident, but the Cardinal will be counting on Drabot to continue being a force in the distance events this year to help fill in the gap left by Ledecky. While distance and middle distance freestyle remain her go-to events, Drabot has said that she prefers training fly, and she could be a dominant force in the 200 fly this season along with Eastin. Drabot qualified for the 2019 U.S. World Team in the event after a second-place finish behind Olympian Hali Flickinger at U.S. Nationals. Look for her to make an impact across the board this season and chase more national titles. The Pac-12 Newcomer of the year and three-time All-American is back. Forde finished a successful freshman year for the Cardinal as an 800 freestyle relay and team national champion. The 400 IM is Forde’s speciality, and she earned a fourth-place finish in the event last year and then went on to place second at U.S. Nationals to earn a spot on the Pan Pacs team. She could make a mark again in the IM events as well as the longer freestyle relays this year.
.@forde_b had SQUAD GOALS cheering her on to second place in the 400m individual medley 🙌. Pickrem finished third in the stacked 400 IM field at last year’s NCAA championships behind Eastin and Ledecky, and she went on to win a silver medal in the same event at the 2018 Pan Pacific championships while representing Canada. Pickrem will race for the Aggies this year as a top performer in the IM, as well as the 200 breaststroke, an event she raced with teammate Anna Belousova in the finals of last year’s NCAA championship. Texas A&M coach Steve Bultman told NCAA.com that the team’s biggest strength this year lies in its breaststroke and IM swimmers, and Pickrem will be one of the leaders of that group. Brown burst on to the NCAA scene as a sophomore, earning a second-place finish in the 50 free behind now-graduated Stanford gold medalist Simone Manuel and second place in the women’s 100 fly behind USC’s Louise Hansson. She also placed sixth in the women’s 100 freestyle and earned All-American honors in three Tennessee relays, with third-, fourth- and sixth-place finishes in the 200 freestyle, 800 freestyle and 400 freestyle relays, respectively. Though she did not qualify for NCAAs as a freshman, Brown is making up for lost time and breaking records along the way. If she maintains her upward trend, Brown could be poised to take home an individual national title in one of the sprint events this season. Returning as USC’s lone NCAA champion from 2018, Hansson is ready to make a mark on the Pac-12 conference and national scene again. She won the 100 fly last year and finished third in the 200, and, after a summer competing in both events internationally for Sweden, she could be in the running for both titles this year. Hansson is also a relay asset for the Trojans and helped them to a seventh-place finish in the women’s 200 medley relay. Comerford is a two-time champion in the 200 freestyle, an event critical for team relays and depth. She also finished second in the women’s 100 freestyle and helped Louisville to four All-American finishes in the 200, 400 and 800 freestyle relays and the 400 medley relay. This summer, she swam to a second-place finish in the 100 freestyle at U.S. Nationals to secure a spot on the 2018 Pan Pac Championships where she finished fourth in the same event and qualified to be part of the 2019 U.S. World team. Comerford was named ACC Swimmer of the Year last year after breaking conference records in both the 100 and 200 freestyle, and this year, Comerford could be a threat to take down the national records in both sprint freestyle races as well. In 2018, Weitzeil raced to a Pac-12 title and a Cal program record in the women’s 100 freestyle before finishing third in that event at the NCAAs. She also earned a fourth-place finish in the women’s 50 free and helped Cal to three relay silver medals in the 200 freestyle, 200 medley and 400 medley relays. She’ll be a front-runner in the sprint events event again this year, and she’s already off to a fast start, winning “Queen of the Meet” honors in Cal’s first season dual with Cal Poly. Along with teammates McLaughlin and Amy Bilquist, the Bears have a real chance to compete with Cal for a national title. McLaughlin’s 2018 NCAA’s were her finest so far as a college swimmer. She took fourth in the 200 fly, sixth in the 100 fly and eighth in the 200 free. She also served as the anchor on Cal’s second-place 400 freestyle relay and the third-place 800 freestyle relay. The senior has battled a series of injuries throughout her college career, but she is back, recovered and ready to make an even bigger impact for the Bears. As a senior captain on the team, McLaughlin enters the season fresh off racing at the 2018 Pan Pacs meet, an experience that is a testament to her ability to overcome injury adversity in the sport and her commitment to climbing the ranks in her signature butterfly and freestyle events. McLaughlin has also been recognized by USA Swimming for her perseverance and is nominated for a Golden Google award for her commitment. Coach Teri McKeever called McLaughlin’s performances this summer an inspiration to her teammates, and she will look to McLaughlin to bring leadership and experience to this Cal team. King, who earned a gold medal in the 100 breaststrokes at the 2016 Rio Olympics, will come into her senior season at Indiana aiming to defend her NCAA titles in the 100 as well as the 200 breaststroke. Should she win the 100 and 200 breaststrokes again, events in which she holds the American record, she will be a four-time champion in both races. She is also a valuable contributor on the Indiana medley relays, helping the Hoosiers to a second-place finish in the 400 medley and a third-place finish in the 200 medleys. Just 1️⃣ day until the Hoosiers start the 2018-19 season! Come out tomorrow and support the Hoosiers at 10 AM vs. Notre Dame, Kentucky and Missouri at the CBAC! In the backstroke events, Nelson will try to claim her first national title, after finishing second and third in the 100 and 200 her sophomore year. The sprint backstroke field will be lighter after the graduation of Ally Howe from Stanford and the departure of Kathleen Baker, who recently signed a contract to go pro, opening up opportunities for Nelson. The Wisconsin junior could also compete for a podium spot in the 200 IM where she finished sixth last year. Nelson’s improvement from her freshman year to her sophomore year was dramatic, as she went from missing out on the consolation final in every event her first year to now being a contender for a national title this year. At last year’s NCAA championships, Haan finished fourth in the 100 back, an event in which she holds the NC State program record. She also earned All-American honors in the 200 back, the 200 freestyle relay and the 400 freestyle relay. The Wolfpack has seen constant improvement over the last several years, and Haan is just one example of that. If she captures an individual title in one of the backstrokes, she will be the first N.C. State women’s swimmer in program history to be an NCAA champion. 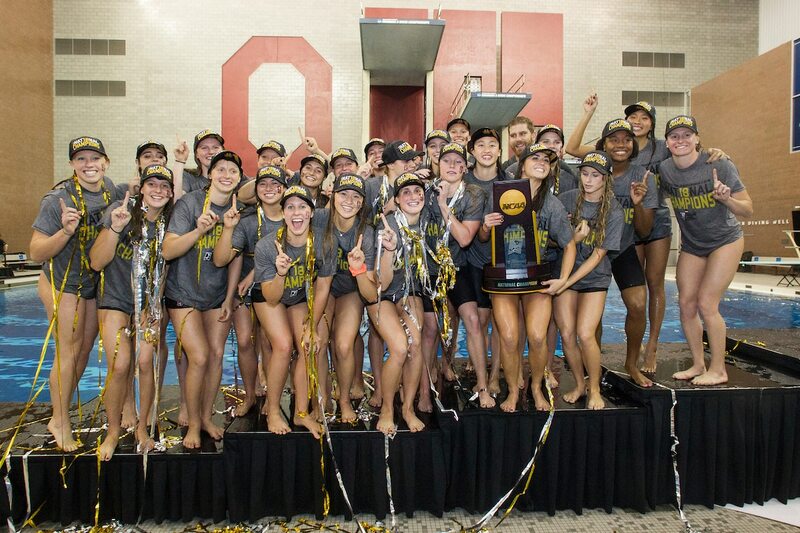 In a competitive 200 freestyle at last year’s NCAA’s, Haughey finished second, and now with the graduation of Simone Manuel and Kathleen Baker, Haughey is a contender to capture a national title. She also finished fourth in the 100 freestyle and ninth in the 200 IM. Her speed will be crucial for Michigan’s relays, and if she delivers the same kinds of performances she showed at last year’s championships this season, she could help Michigan to its fourth-consecutive Big 10 title and perhaps pick up an NCAA individual title as well. Seidt was second in the 200 backstroke at the NCAA championships her sophomore year behind Cal’s Kathleen Baker, who will not be competing collegiately this year after going pro. She also took seventh-place in the women’s 200 IM, another stacked event this year. Seidt carried the momentum from her All-American season into the summer, where she placed sixth in the 200 backstroke and sixth in the 200 fly, earning a spot on the U.S. National team as a result of her swims. She will be a key asset for the Wildcats this year in the distance back and fly races and could also be dangerous in the IM. A distance swimmer with Penn State, McHugh became be the first Nittany Lion to win a U.S. national title in swimming when she took first in the women’s 400 IM at the 2018 USA Swimming Phillips 66 Nationals. McHugh will be competitive in the event at the NCAA level, but she will again face a competitive Stanford duo of Eastin and Forde in that event. She also returns this season after a second-place finish in last year’s 1650 behind Ledecky. McHugh’s distance strength and the momentum that she’ll have coming off of a successful summer competing at Pan Pacs could give her the tools necessary to make a mark on NCAAs this year both the 1650, the 400 IM and the 500 freestyle.